HIS Majesty the Sultan and Yang Di-Pertuan of Brunei Darussalam and Her Majesty Raja Isteri Pengiran Anak Hajah Saleha yesterday morning attended the coronation of His Royal Highness Sultan Ibrahim ibni Almarhum Sultan Iskandar, the fifth Sultan of Johor, at the Istana Besar, Johor Darul Ta’zim, Malaysia. 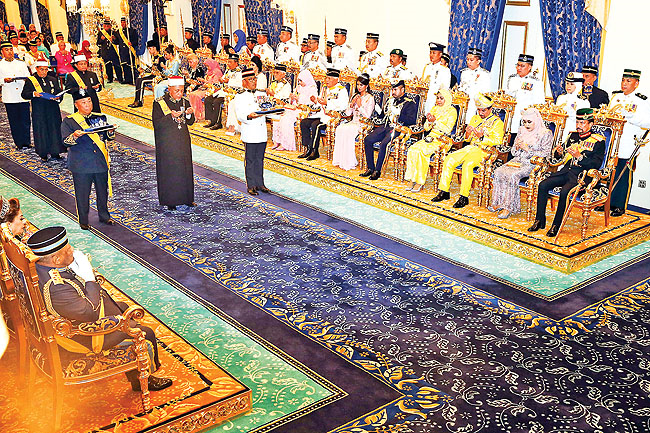 Their Majesties were greeted on arrival at the Istana Besar Johor by Dato’ Abdul Rahim bin Ramli, Yang Di-Pertua of the Johor Council of Royal Court, before proceeding to the Holding Room at Istana Besar Johor, said a statement from Brunei’s Prime Minister’s Office. From the Holding Room, Their Majesties together with the Malay rulers, heads of Malaysian states, the Prime Minister of Malaysia and spouse and other dignitaries proceeded to Bilik Singgahsana for the coronation. His Royal Highness Sultan Ibrahim and Her Royal Highness Raja Zarith Sofiah binti Almarhum Sultan Idris Shah, Permaisuri of Johor, arrived and the ‘Lagu Bangsa Johor’ anthem was played. 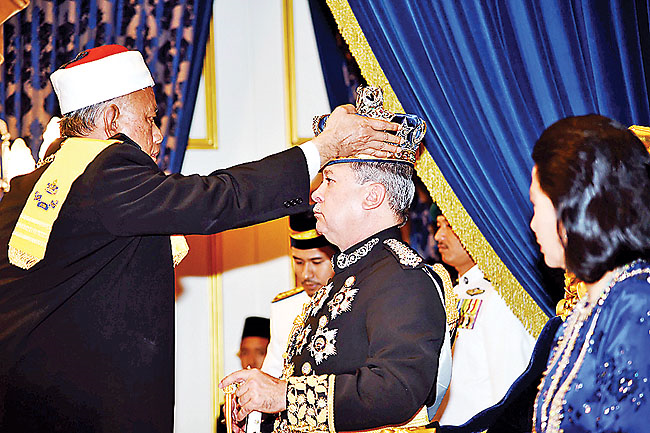 The ceremony began with the reading of the promulgation text by Dato’ Seri Mohamed Khaled Nordin, Chief Minister of Johor, and the reading of the coronation text by Dato’ Abdul Rahim bin Ramli, Yang Di-Pertua of the Johor Council of Royal Court. The ceremony continued with the Titah Ikrar by His Royal Highness Sultan Ibrahim which was followed by the crowning of His Royal Highness Sultan Ibrahim as the Sultan and the Sovereign Ruler of the State and Territory of Johor Darul Ta’zim; and Her Royal Highness Raja Zarith Sofiah as the Permaisuri of Johor by Dato Haji Mohd Tahrir bin Dato’ Kiyai Haji Samsudin, State Mufti of Johor. The ‘Lagu Bangsa Johor’ anthem was played accompanied by a 21-Gun Salute, followed by a Doa led by Dato’ Haji Yahya bin Ahmad, Deputy State Mufti of Johor. His Royal Highness the Sultan of Johor and Her Royal Highness the Raja Permaisuri of Johor then received in audience His Royal Highness Tunku Ismail ibni Sultan Ibrahim, Tunku Mahkota Johor and wife, Her Highness Che’ Puan Khaleeda binti Bustamam; followed by other members of the royal family, Dato’ Seri Mohamed Khaled Nordin, Chief Minister of Johor and Dato’ Abdul Rahim bin Ramli, Yang Di-Pertua of the Johor Council of Royal Court. His Royal Highness the Sultan of Johor and Her Royal Highness the Raja Permaisuri of Johor proceeded to the Palace Balcony to receive the Air Salute accompanied by the ‘Lagu Bangsa Johor’ anthem before departing for the royal procession around the City of Johor Bahru. 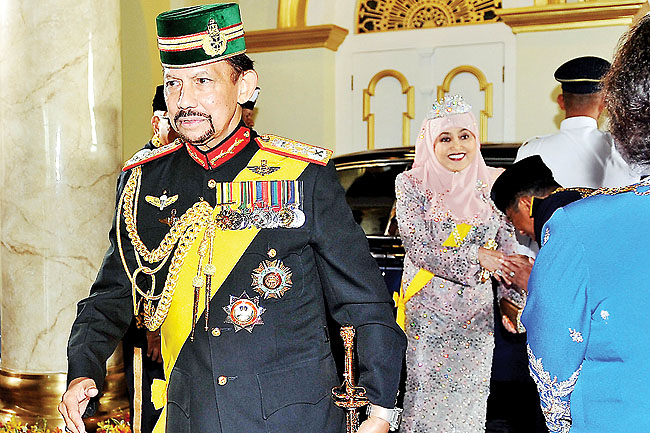 At the end of the ceremony, His Majesty the Sultan and Yang Di-Pertuan of Brunei Darussalam and Her Majesty Raja Isteri Pengiran Anak Hajah Saleha along with other royal guests left the venue. Accompanying Their Majesties to the coronation were Pehin Orang Kaya Laila Setia Dato Seri Setia Awang Haji Abdul Rahman bin Haji Ibrahim; Minister of Finance II at the Prime Minister’s Office; Pehin Datu Seri Maharaja Dato Paduka Seri Setia (Dr) Ustaz Haji Awang Abdul Aziz bin Juned, the State Mufti; and Pehin Orang Kaya Shahbandar Dato Seri Setia Haji Awang Mohd Nawawi bin Pehin Orang Kaya Shahbandar Haji Awang Mohd Taha and their spouses.